Fortunately, nearly every habitat on Earth is home to a group of organisms that are easy (not to mention fascinating) to observe, and also give scientists a good general picture of the overall health of an ecosystem: birds. Using bird as indicator animals is hardly a new concept for humans. Coal miners famously used canaries as a warning of dangerous conditions, as scientists use them to warn us of problems in natural systems today. Birds are often sensitive to changes in the environment, and changes in bird communities are often the first symptom of fundamental changes in a given ecosystem. With this in mind, one of the first things The Phoenix Conservancy does with each new project area is conduct a survey of the bird species present. This gives us a starting point to measure the effects of our restoration work, and to monitor the progress of a regenerating ecosystem. A great example of this principal in practice is our collaborative work with Washington State University on Smoot Hill, in the Hudson Biological Reserve. This reserve houses one of the very few remaining fragments of unaltered, native Palouse Prairie, directly adjacent to historically cultivated land that is now covered in non-native pasture grass. 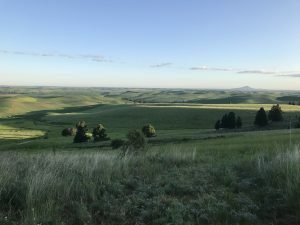 This provides a unique side-by-side comparison to inform Phoenix’s restoration work throughout the Palouse; as our restoration work progresses, new species found in native prairie begin to move in, and regular bird surveys help us track this regeneration. For each point count, surveyors stayed in one location for 5 minutes and recorded every unique individual that we saw or heard singing. The results speak for themselves, and provide a clear ruler for measuring our efforts: if restoration is successfully progressing at a given site, the bird community will look more like Point Count 3, and less like Point Count 2. As a result, areas dominated by weeds, particularly the extremely toxic Poison Hemlock, are often devoid of birdsong. This lack of birds in a habitat is an excellent indication of poor ecosystem health, and is obvious even to relatively new birdwatchers. We were thrilled to have help with our bird surveys of Conservation Park this year, thanks to the first and second grade students of Palouse Prairie Charter School. The class immediately noticed the silence of weed-dominated sections of the park, in contrast with the park sections containing native plants. In seeking to restore ecosystems to a state that is healthy for biodiversity and humans alike, birds play a vital role as both ruler and alarm bell. Aside from their scientific importance, their ubiquity and beauty makes them accessible to every human on Earth, inspiring many generations of naturalists, as well as millions of recreational birdwatchers around the world. They are charismatic, conspicuous, and just plain fun to observe. So fun, in fact, that their absence is just as conspicuous as their presence. Even to a first grader making their first connections with the natural world, observing a weedy field without birds seems strange, disorienting. The question that arose from these young birders echoes one of the most fundamental signs of an ecosystem in distress, the warning that inspired Rachel Carson’s Silent Spring in 1962, and one of the most important metrics that The Phoenix Conservancy uses as we work to restore endangered ecosystems. 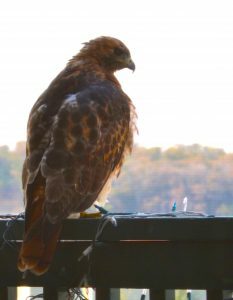 Interested in birds? Know a beginning birder, or want to start birding yourself? Check back in a few weeks for tips on how to get started in birding, avoid common mistakes as a beginning birder, and learn to identify and connect with the birds that share your world.